Delilah Nevaeh Valdez looks like any other 19 month old today with chubby cheeks, sleeping peacefully with a pink pacifier in her mouth but only a few months back doctors had given her just 24 hours to live. It took 7 organ transplants and dedicated efforts of medical team to save the baby. Julissa Cerda, 24 had given birth to Delilah 6 weeks early in September 2009. Doctors told the new mother and father Agapito Valdez that their baby was dying. “When she was born they gave her 24 hours to live,” said Jullissa.”They basically told us she was going to die because she couldn’t eat. Delilah had a rare congenital and often fatal condition called Megacystis Microcolon Intestinal Hypoperistalsis Syndrome. It prevented her stomach, intestines, kidneys and bladder from working properly. Three months ago doctors decided to transplant seven of the baby’s organs to help her eat. These were the liver, stomach, pancreas, small intestine, large intestine, kidney and spleen. 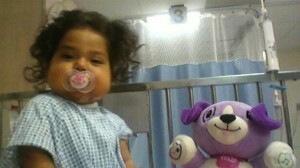 As a 16 month old in January this year Delilah underwent the crucial surgery at Jackson’s memorial. The transplant was the 299th at the hospital, but even the doctors knew that it was the post surgery recovery that was important. The transplant was successful and what was an even better news was that the little girl learnt fast to eat food. But in Delilah’s case, things were different. Now 19 months old and more than 26 ½ pounds Delilah will be leaving Jackson Memorial with her parents by the end of this week. Her parents have also not forgotten the special gift of life they received from the unknown 3 month old whose organs were donated to their daughter. I am truly happy for Baby Delilah. I know to well what the parents went through. My daughter who is now seventeen also had a 7-Organ transplant in December 2007. I wish the Valdez nothing but blessings.